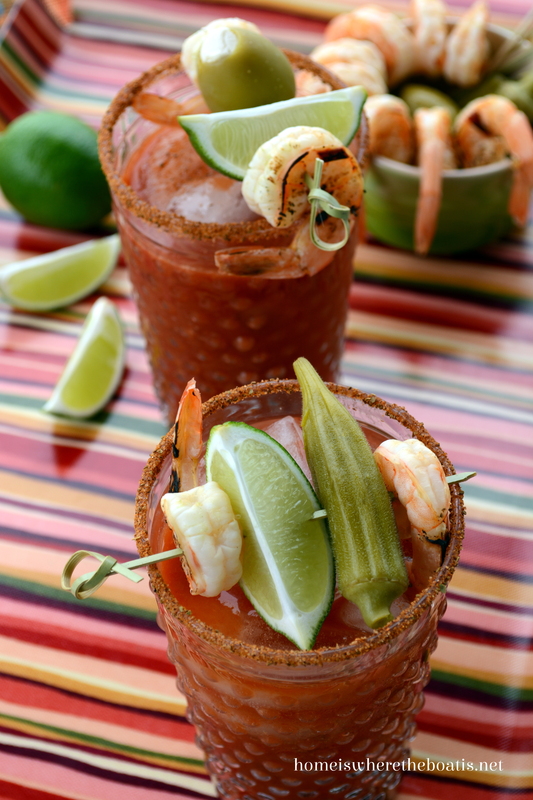 Mystery Ingredient Club: Chipotle Shrimp & Chipotle Bloody Mary! return of The Mystery Ingredient Club! I used Chipotle Peppers in Adobo Sauce. 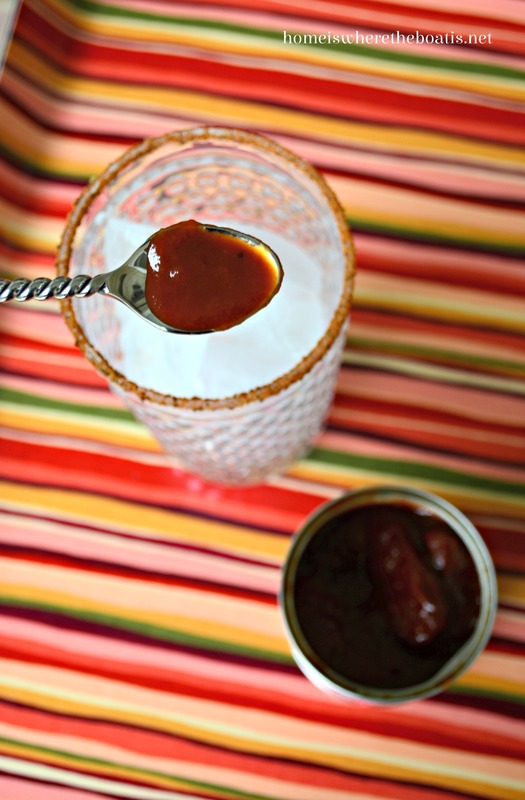 Chipotle peppers are smoked and dried jalapeños and the adobo sauce is a paste or sauce made from peppers, tomato, onion, vinegar, herbs, and spices. 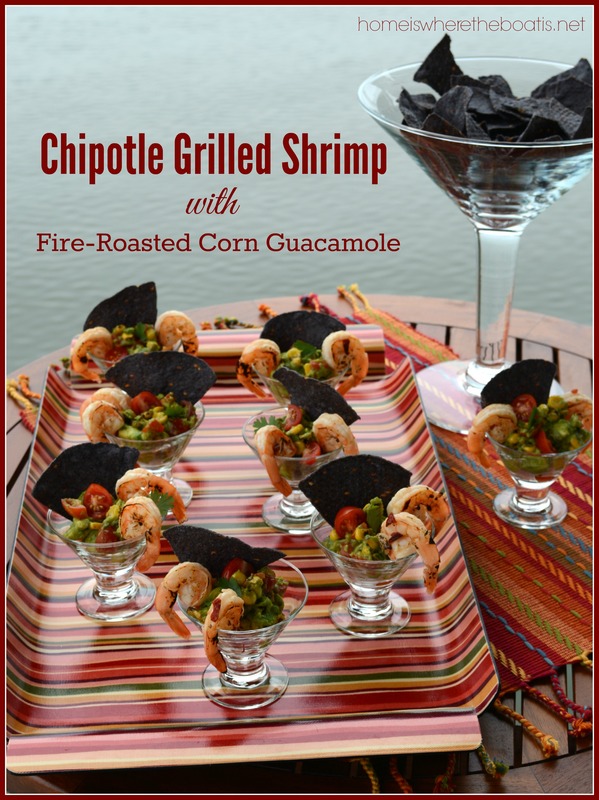 I found a recipe for Grilled Chipotle Shrimp that I tweaked a bit for half a recipe and an appetizer serving! 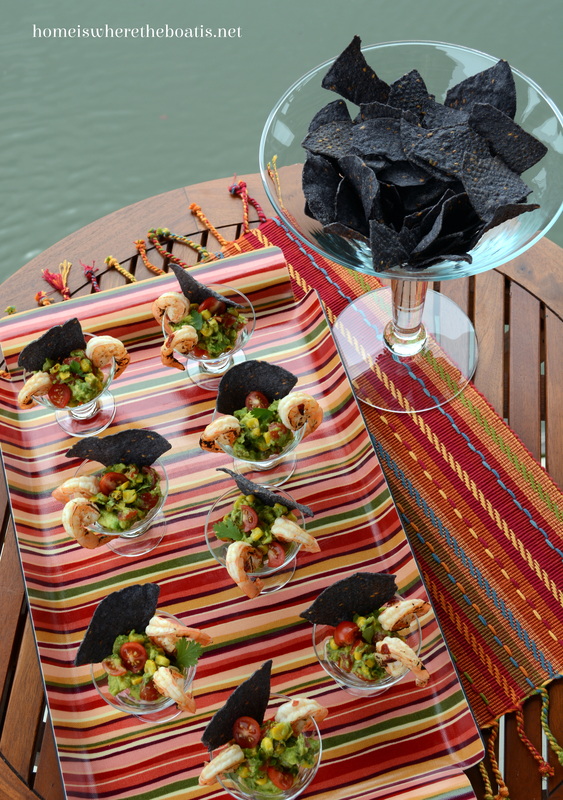 I served it with my favorite guacamole recipe and blue corn tortilla chips. You could also serve these shrimp with an easy Lime-Cilantro Sour Cream to cool the heat from the peppers! 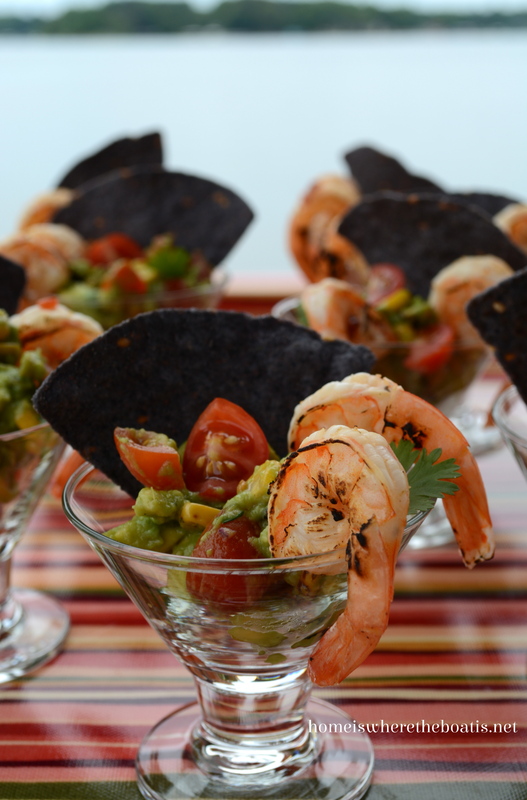 Serve in individual cups or glasses for a party appetizer. I used my mini dessert glasses, also fun for serving mini layered taco dips, but you can use plastic cups for a crowd for easy clean up. 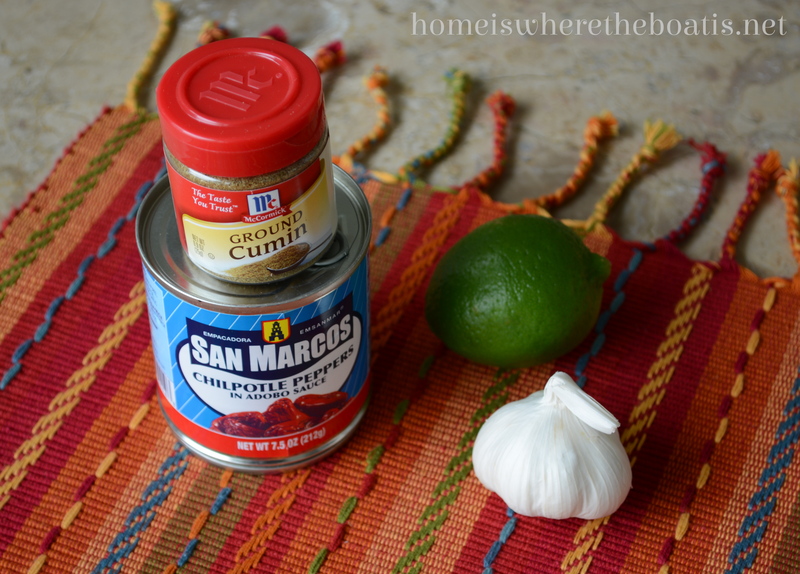 In a small pan, bring the brown sugar, chipotles, adobo sauce, garlic, water, lime juice, oil and salt to a boil. Reduce heat; cook and stir 2 minutes longer. Remove from the heat; cool completely. Transfer mixture to a large resealable plastic bag. Add the shrimp; seal bag and turn to coat. *Marinate in refrigerator for up to 2 hours. 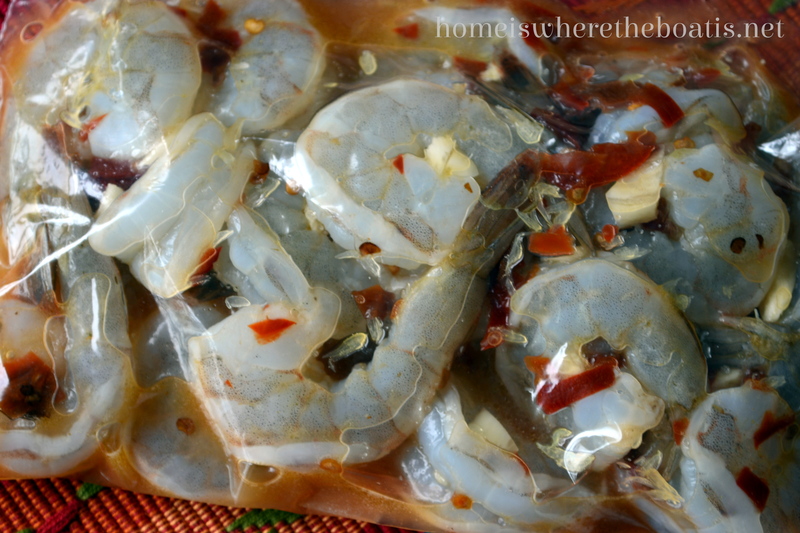 * For more flavorful shrimp that look less anemic :) marinate longer than 45 minutes. Next time I would marinate them the full 2 hours. Grill shrimp on skewers (or in grill pan) over medium heat for 6-8 minutes or until shrimp turn pink, turning once. I mixed my favorite guacamole (minus the bacon) using Trader Joe’s or Trader José’s :) frozen fire roasted corn. If you don’t have a Trader Joe’s near you, grill 2 ears of corn until charred and cut off the kernels. 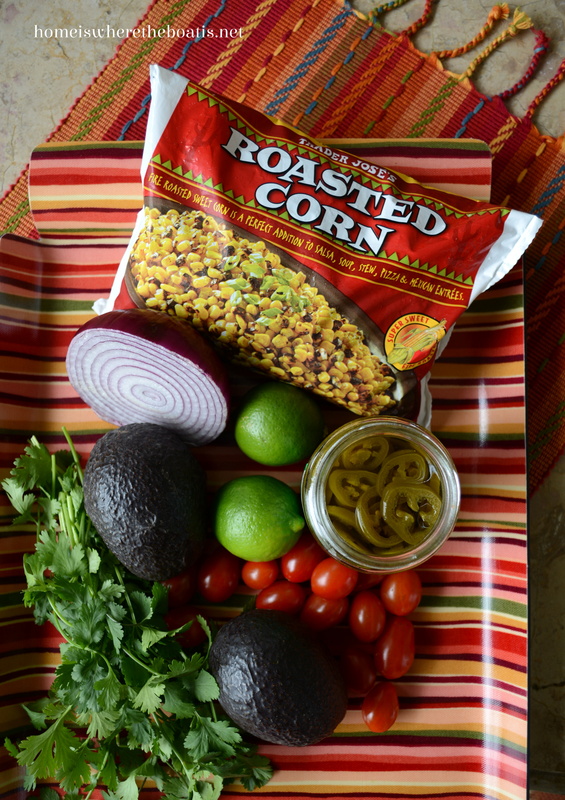 The roasted or grilled corn adds just the right amount of sweetness and smokiness to the guacamole or is wonderful mixed with your jarred salsa! traditional heat of horseradish and/or tabasco! Run a wedge of fresh lime around the edge of 4 glasses. 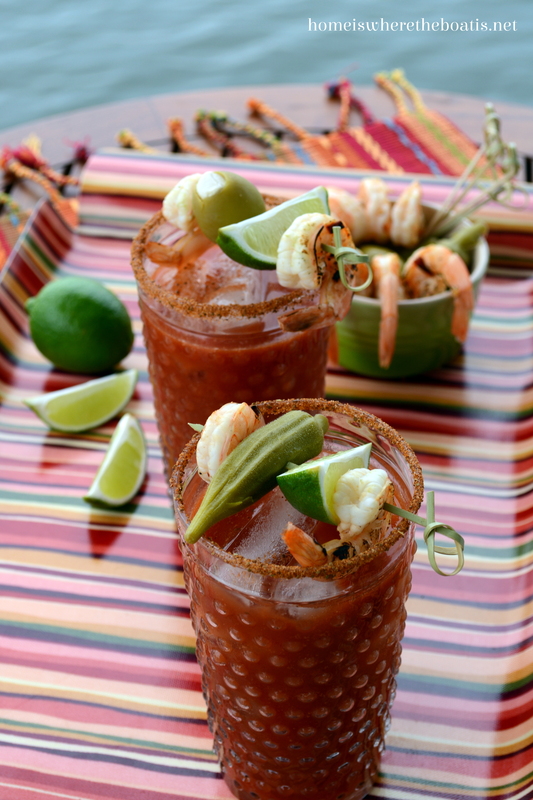 Dip each glass in the celery salt or Bloody Mary rimmer. To each glass, add 2 ounces vodka, 1 teaspoon chipotle paste/ adobo sauce and 1/2 teaspoon Worcestershire sauce, and a sprinkle of celery salt and mix. Fill each glass with ice, and top off with tomato juice. 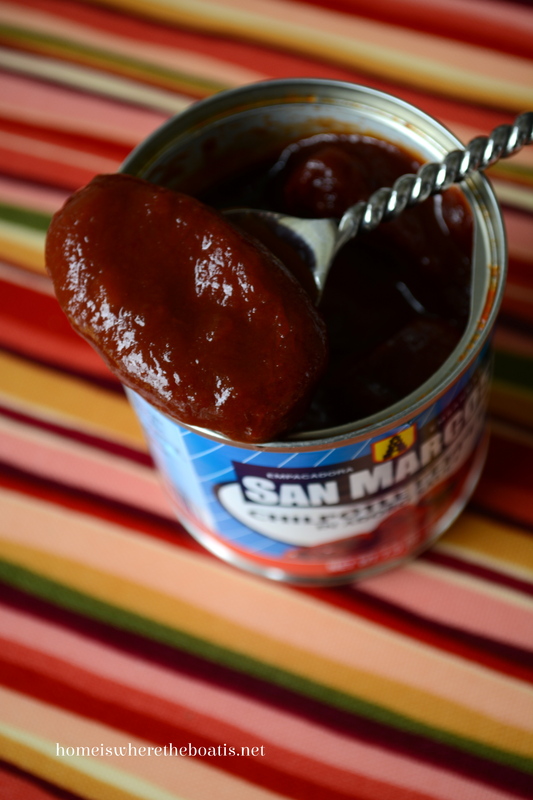 Turn up the heat with more adobo sauce or chipotle paste or add tasbasco and/or horseradish if you prefer. Garnish with Chipotle Grilled Shrimp, lime, olive, and/ or pickled okra. You can find a printable recipe here. and Halloween Dipped Apples & Potions Lab Libation. I’m joining the Mystery Ingredient Club! See what the Mystery Ingredient Club members have cooked, their links with recipes will open on another page! I’ll have to remember the Bloody Mary idea when we get together for the Fourth of July. 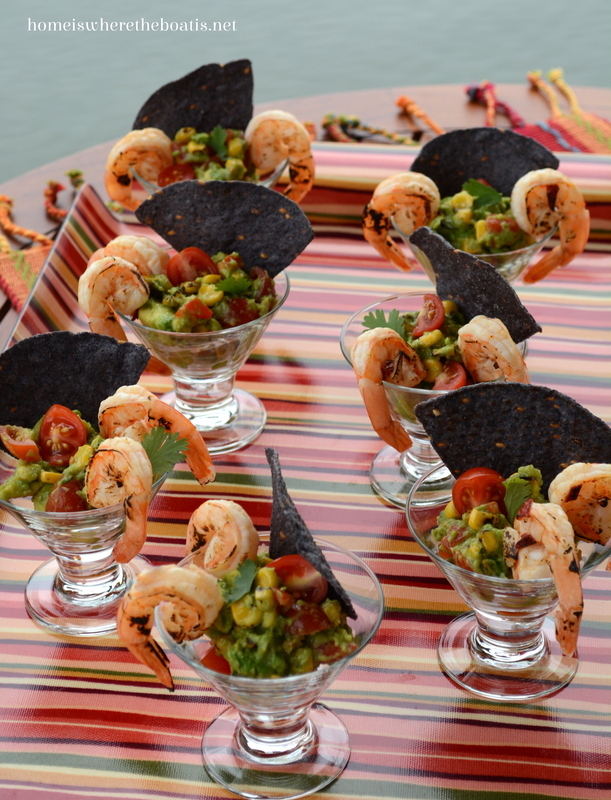 That will be the red, in my Red, White and Blue tray ;o) The grilled chipotle shrimp look fantastic! Wow, what an appetizer, Mary, and drink to go along. I’m a fan of the fire-roasted corn from Trader Joe’s, as it’s a time saver. 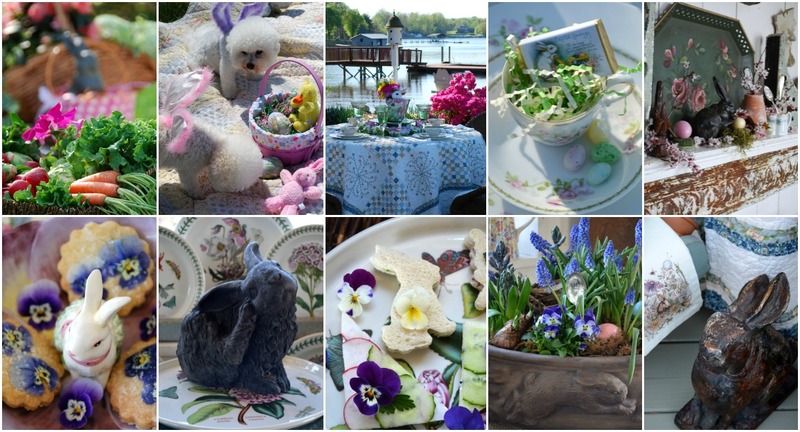 I’ll bet you and your hubby had a delicious party sitting by the lake and enjoying your pretty view. I love bloody Mary’s ! Yum. 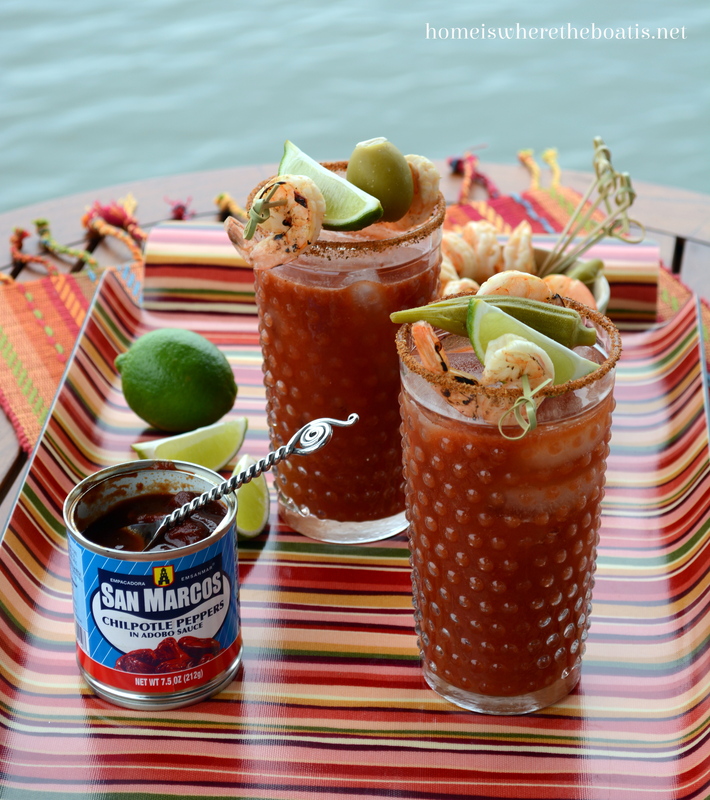 I will give the Chipotle Bloody Mary recipe a try. Don’t know if we will like the heat!? I know my husband will, nothing is too hot.🔥 the guacamole also sounds good. 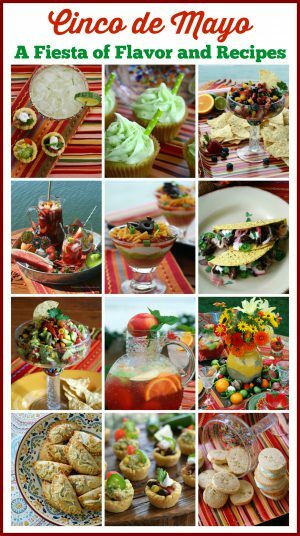 Thanks for the variety of recipes you share with us. 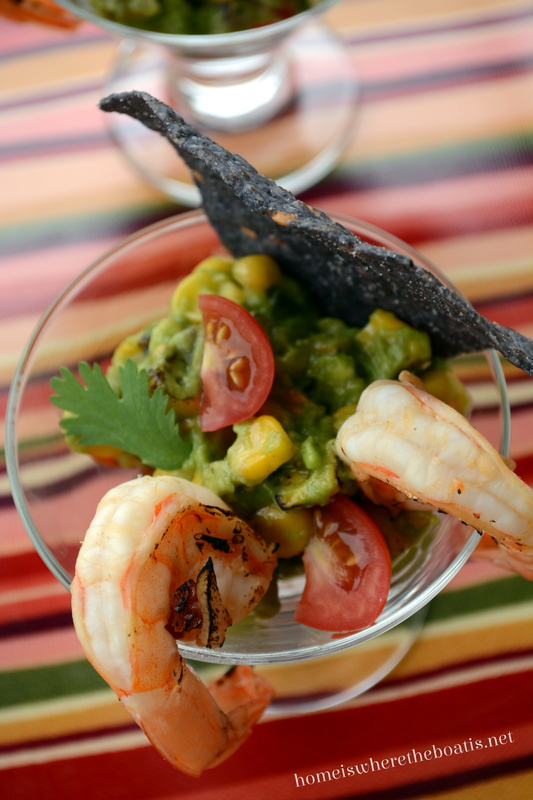 We love trying new ways to make guacamole around here, so I’ll definitely give it a try! 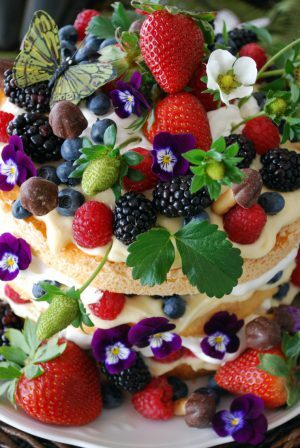 Stunning presentation, and the recipes look wonderful as well!! I have to check this “club” out! It’s been too long! 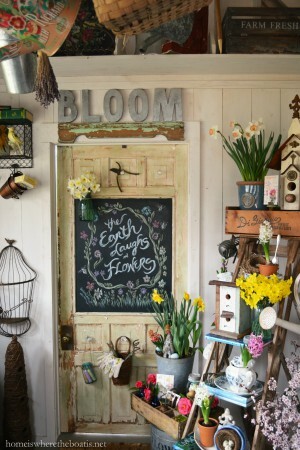 Thank you for sharing and for the inspiration! Just sensational Mary! I am definitely serving this this summer. All of your recipes that I have tried are winners. And this looks AMAZING!!!! Bobby will love that Bloody Mary too! Mary, you knocked it out of the ballpark! Oh, what I would give for a bloody Mary, grilled shrimp, and the most delicious guacamole ever. And that gorgeous striped tray pulls together the heat and fire of the peppers. These recipes are just the thing that Dr. W needs to put a little pep in his step! Thank you SO much for cooking with me and the ladies today. P.S. I’ve sent you a little gift! We need a Trader Joe’s – I want to buy roasted corn!! This all looks amazing! Oh, my you are making my mouth water. I need to make a trip to TJ to get that grilled corn. Looks so good Mary!! !…The food and the presentations look like it just jumped off the pages of Bon Appetit !!.. your photos are always over the top, out of the park gorgeous!! What a fabulous combo; the shrimp, bloody Mary’s and quac!! Wow, I need to try every one. Mary, this is definitely a winner. I’m going to make this as appetizers for house guests that are arriving in a few weeks. It’s the perfect summer dish. Mary, thanks so much for the self-named drink Bloody MARY! I will think of you when I concoct this fabulous libation and appetizer! As usual, your pictures are fabulous too! Beautiful presentation, Mary! WOW! I am still feeling the heat from my first ever try of chipotle! Pass the vanilla pudding! Can’t wait to see what is next, hope it is something cool, temp wise! Oh boy, does THIS look yummy, Mary!! 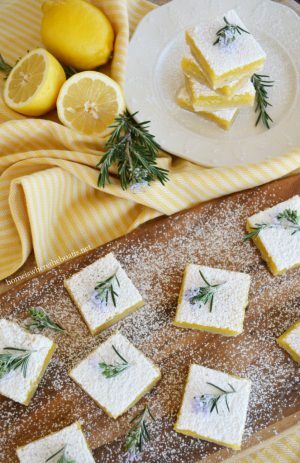 Thanks for sharing the idea & recipe …love how you used “OUR” little mini dessert glasses. I have not used mine in months & this is the PERFECT summer time treat to do so. They both look and sound wonderful…my kind of treats! You do such a wonderful job with your photos. You should be a food stylist!